in an attempt to help the overwhelming exhaustion that's been plaguing me in recent weeks, i ventured to brighton beach yesterday with shane and my sister-in-law for a few blissful hours of lazing in the sun, snorkelling over starfish, anemones and the odd beer can, and seeking out all tiny or especially beautiful shells. ...sigh... nice. it's been far too long since i was at the beach. it was a busy little weekend in my shop as well, with 5 oobees now currently in transit to their new homes in canada, the UK and right here in australia after a trip to the post office this morning. it makes me so excited every time i get notice that something has sold - i really, really love it! and although selling makes me want to get into the craft room and MAKE MORE, MUST MAKE MORE, i've decided to take this week off crafting to concentrate on my buddy's website. i've been procrastinating on it for too long so i'm going to really dedicate some time every night this week with the reward of a full-day sewfest planned for sunday. i have about 5 oobees cut out and ready to sew, most out of fabulously patterned vintage cotton, and i can't wait to see them all finished up with wee faces. cute. this is one of my very favourite new (to me) blogs, i absolutely love the writing style and brilliant craft work displayed. just realized that i don't actually know the author's name but she's pretty clever, all the same. oh wow, rhyming. i am tired - just go over for a visit already! wow how exciting, well done on the etsy sales. What is it with this crafting addiction? I too have in place a self imposed ban from the sewing machine after too many midnight sewing fests!! Nice to hear you took some time out to just.....be. Love the sea urchin shells! leslie, what a nice surprise to find you linked to my site today! thank you. it is a perfectly lovely way to start the week. 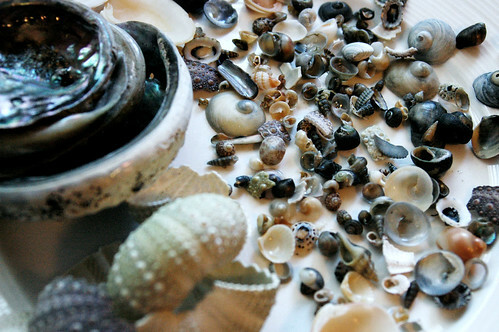 your treasures from the beach look wonderful, especially the sea urchin shells, beautiful. we're in the midst of a brutal cold snap - ARGH! Thanks for your blog treats! I'm always looking forward to these posts. Love your stuff, by the way. Sounds like you've been busy indeed! Go oobees, go! Aww, look at all those teeny little shells - it's my favourite thing to collect shells at the beach. Looks like you might have some new stuff to make pendants...what a selection! Man what I wouldn't do to be snorkelling somewhere warm it's um 12 degrees out here. OH and I got your Oobee and other wonderfulness. THANK YOU! I just finished gushing about you on my blog. And your blog is beautiful. (Here via secondhand gods).